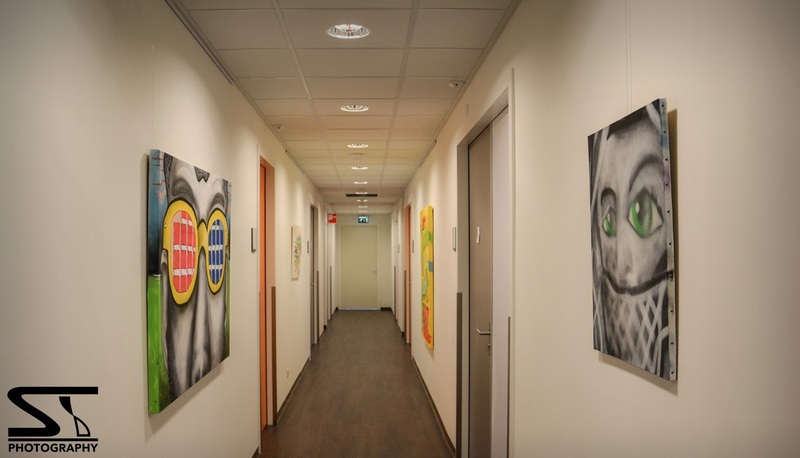 Today we went to the medical centre to put up my paintings at Park Medisch Centrum Rotterdam. I already got permission, but with all the commotion around it I was a bit nervous when we arrived. Thanks Paul from Ropana for marketing me and my work at Park Medisch Centrum, and Muis for taking care of the canvases while driving to the location. Really nice opportunity to gain more success! The few people I saw were positive in an instant, that's a good sign! Work hard, and you will get there is what they told me, and its paying off! As you may have known, I wanted to cover at least 2 works in the exhibition and I talked about those 2 earlier in a quick 'flyer like' preview I gave you guys; 'Typo Motivation' and 'See Perspectives'. 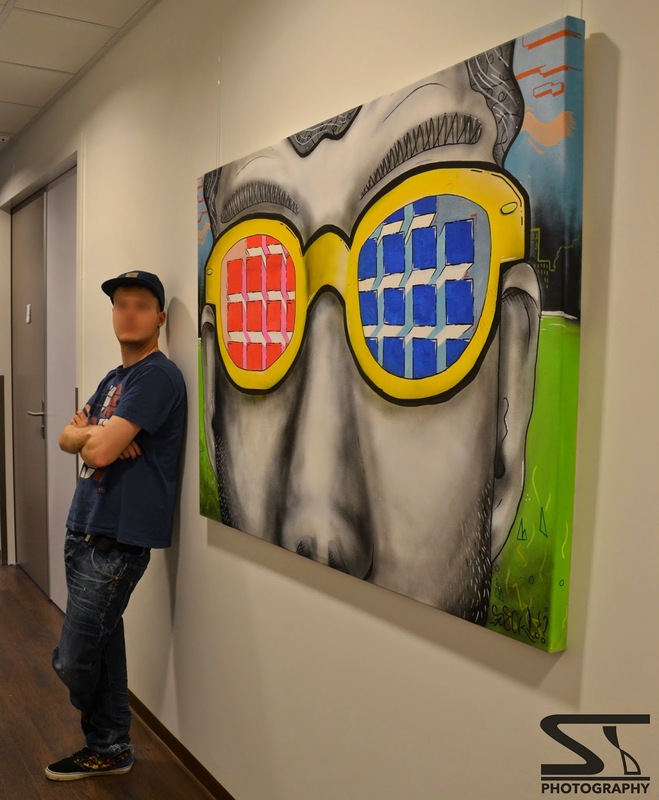 Both of the canvases are made with spraypaint and markers, and they have the same size; 140 x 100 cm. I have used many bright colors, as its a sort of an 'Feelgood - show'! Just look further in life! Below is the explanation of the separate works, pictures are taken by ST Photography. Feel free to click for a bigger picture! This canvas is a qoute that will let you feel good, and also looks nice on the wall. I was inspired by those typical lettering styles from the fifties, but every word 'speaks' a different style. There are some 'Vegas Casino' letters, an advertising arrow, letters that are folded and some 3d effects. Its really clear actually, and because it is typography everyone can understand it, so the view and meaning of the work is really obvious. 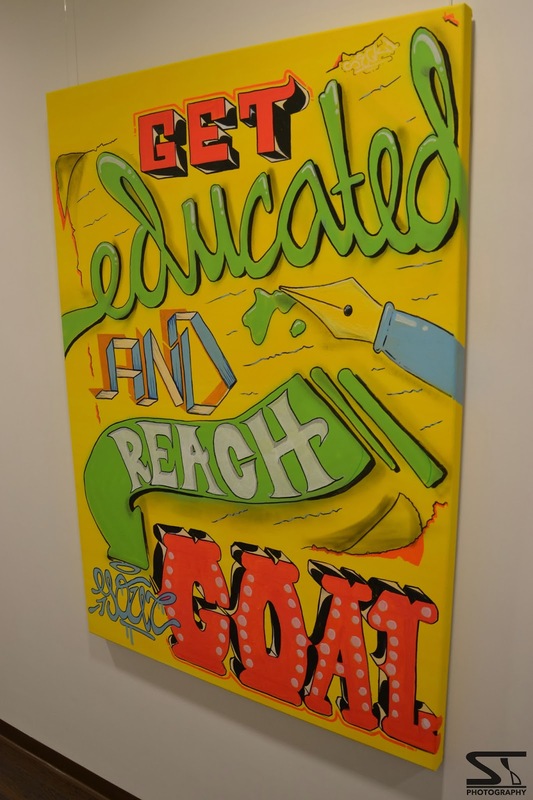 The meaning of this work is the exact opposite as the other one; The 'Typo Motivation' piece was understandable in the blink of an eye, this one is totally up to you. I did much sketching work before I got my idea up the canvas, and I reworked the details many times until it was perfect. The thing that I wanted to show, my idea behind this, is that you have to work hard if you want to get there. Never give up. 'See Perspectives' is invented in a time that I was a bit depressed, I had to draw to get over it.. Put my emotions in it. That's why I am so proud about this one. The other works that are displayed are not for sale or already sold, like the 'Color Cape' work from 2013. If you are interested in one of the 2 above, you can mail me at seckonegraffiti @ gmail.com, at Park Medisch Centrum I wrote more contact details on the price tags. I gave the secretary ladies a couple of stickers too, just ask for them if you want one!